Description:- Patello femoral knee pain or anterior knee pain is possibly one of the most common knee pain issues seen in active people. 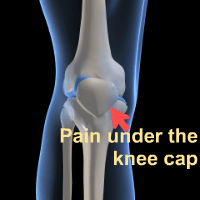 Commonly the issues relate to the way the knee cap (patella) moves in relation to the thigh bone (femur). 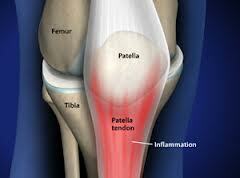 Often pain is described as being underneath the patella either during or after activity. The pain is usually a dull ache or toothache type pain rather than a sharp pain. Causes:- There are a number of reasons that may cause pain in this area. Imbalance in the muscles which make up the quadriceps can mean the movement of the patella can move off to one side rather than staying in the middle of the knee. Chondromalacia patella which is softening of the cartilage underneath the knee cap and is common in children and young adults. Poor foot function or a foot that rolls in either too much (over pronation) or a foot that rolls in too little (under pronation). Poor foot posture causes the shin bone (tibia)to rotate, changing the way the quadriceps pull the patella in relation to the knee. Treatment:- To establish whether you are likely to have any of the above issues it is important to be biomechanically assessed by a professional before commencing treatment. Strengthening exercises for the quadriceps and foot orthotics can be helpful in managing the symptoms. Patella tendoniits (jumpers knee):- Patella tendoniitis differs from patellofemoral pain as the pain relates to pain below the knee cap in the qyaudriceps tendon which inserts into the top of the tibia (shin bone). The tibial tubercle is a boney lump which is at the top of the tibia in the centre immediately below the knee (see picture to the left). Osgood Schlatters disease:- Is more specifically related to the boney lump (tibial tubercle) in children or young adults being softened. The pull from the quadriceps muscle which inserts into the tibia at the tubercle (top of the shin) stresses the insertion point causing the area to become painful and inflamed. Causes (of both):- Jumping, running or kicking can stress the tendon and insertion over time, which causes pain in this area. Treatment:- Avoidance of the activity causing the problem is advised as well as Physiotherapy to help reduce the symptoms. 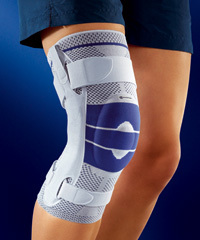 Knee braces can also help to help reduce the pain from the pull of the quadriceps tendon.